I was thinking about magpies because there is a boisterous flock (or maybe it’s murder since they are in the same family as crows) that hangs out across the street all the time. Their presence made me think that I’ve never painted one and that I should. So that day at work, during my lunch break I googled MAGPIE. As I was reading about magpie behavior, Kenny walks in the back door and announces that we have a visitor. A magpie had flown into the backdoor of the sign shop just as I was reading about them. I’m glad I wasn’t reading about skunks or grizzly bears! 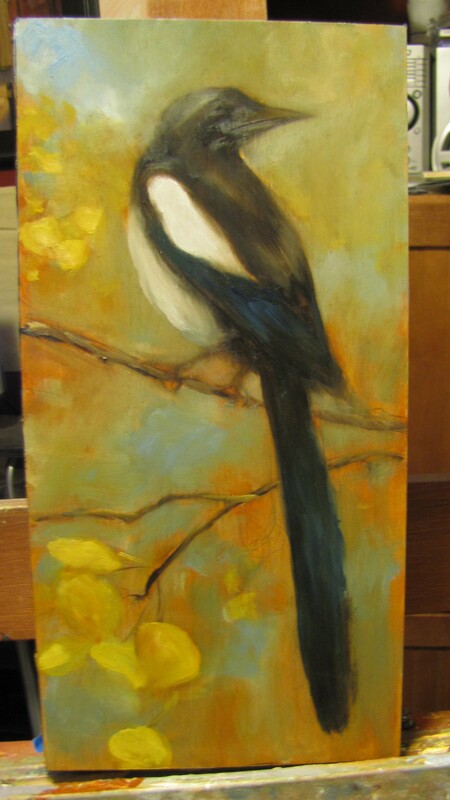 So anyhow, I decided that that was a sign that I need to start a painting of a magpie. Here is my start. I’m not finished yet.